This, courtesy of Nicky Hilton's Twitter (where else?) 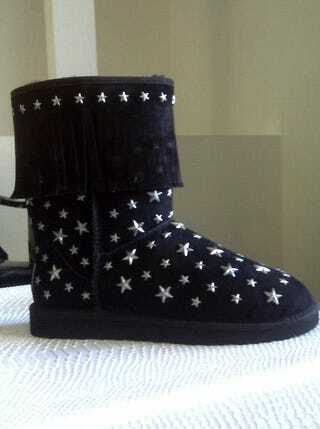 is the result of Jimmy Choo's ill-advised foray into selling $795 Uggs. It's an Ugg. With fringe on it. And star-shaped studs. "With Ugg, we've taken the traditional boot and just decorated it. So we've put the DNA of Jimmy Choo in the details," said Jimmy Choo president Tamara Mellon around the time her unusual collaboration with the misunderstood slipper brand was announced. But Uggs "with the DNA of Jimmy Choo" are horrible and they need to go away now. In fashion years, that might as well have been back in the Pleistocene. Since then, we've seen studded handbags, studded shoes, studded bracelets, studded blazers, studded bustiers, and studded shorts. Studded platforms and studded belts. Studded t-shirts have been worn with studded jeans and studded sandals. They have even made studded flannel. Every available surface has been pricked with an awl and made to accept stud prongs. Enough already! Although it has to be said that adorning Uggs with studs has created a special and unique form of ugliness, this was one of those things that should never have made it out of the prototype stage. These shoes look like crusted marshmallows. Or pillows that would hurt you. They look heavy. They look like the footwear of choice for herpetic "Jersey Shore" groupies. They are one fluffy sheepskin pelt of do not want! on a rubber sole. Please let's all laugh at the people who drop $800 on them come fall.